The climb of Mt Kinabalu through Timpohon Gate starts with walking downhill. It is a short walk until you reach a waterfall. This is probably the best scenery that you could have until reaching 5km. I agree with most opinions that I heard or read in blogs or websites that Timpohon trail has very little scenery to be worth mentioning. As I am really not a person into nature, so I am perfectly fine with the scenery or, well, simply lack of scenery of the trail. After the waterfall, it is all the way uphill. From Timpohon Gate to 5km, the hike is relatively easy if you don't suffer from altitude sickness and you have correct walking strategy of conserving energy by walking at your own pace. Since early this year, I have been hiking with my friends up a hill nearby, Bukit Gasing, on most Sunday morning. We start before dawn and walk with torchlight. It usually takes us 35 minutes to reach the top and another 20 minutes back to the bottom of the hill. In the last stretch of Bukit Gasing trail before reaching the "peak", there is a final uphill walk of 320 - 350 steps. That stretch is not a difficult walk, but it is just keep going uphill for 320 - 350 steps. And yes, the entire 6KM of Timpohon Trail toward Laban Rata is not more technically challenging than the last stretch of Bukit Gasing. In fact, I consider the first 5KM walk to Laban Rata Resthouse to be easy, technically. The only thing is that the trail is simply steep and long for hikers to not to feel tired. We have got the best scenic view in 5km. 5.5km onward. Walking on the stones. I found the last 0.5km toward Laban Rata is extremely tiring, though technically easy. I found it challenging to balance myself walking on the stones due to altitude sickness. I moved slowly as every quick move would caused a rush of blood up from my neck toward my head. My ankles were aching. difficult to balance myself walking on the stones. You will probably start the climb at 2.30pm after the buffet supper at Laban Rata Resthouse. There are two parts in this stretch of route. The first half of the route towards Sayat Sayat checkpoint is an uphill walk on staircases and rock faces. Again, a simple but steep uphill walk. The second part of this route requires you to hold a rope, walk horizontally on a ladge (at a slope approximately between 45 degree to 70 degree) for a while, and ultimately pull yourself up with the rope on a slope. Photo in Alice's camera. Zoe pulled herself up the slope. After the slope part, you will reach Sayat Sayat, the last check point hut before the summit. This is the place where you confirm, with the guard sitting in the hut, your attendance to the peak. When you are back to Kinabalu Park Headquarters, you will receive a colorful certificate to prove that you had reached the summit. Sayat Sayat is also the last toilet place before reaching summit. Therefore, it is advisable to clear your bladder there. Don't miss the toilet here. There is no more toilet above this line. After Sayat Sayat, you will walk on a big wide slope all the way to the summit, Low's peak. It is a big wide rocky plateau on top of the mountain. The plateau is steep. It is extremely uncomfortable for my ankles to walk on the steep rock face. A few times I thought I was about to twist my ankles. The altitude is high and the oxygen is low. I could not move fast then, as every simple move seems to be a strenuous exercise. This is the place, right after Sayat Sayat and before Donkey Ears peak, that many said that they were pondering to give up the climb or regretting of climbing the mountain, etc. At that point, I only regretted why I brought my heavy SLR. Ultimately, at approximately 5.30am, I had to stop at somewhere near Donkey Ears Peak to rest and to watch the sunrise. From here onward the difficult part is over. It is all the way up to the foot of Low's Peak. We followed the white rope laid on the ground. The rope leads the hikers to Low's Peak. Don't walk too far away from the rope. There was a fatal accident when an English girl, Ellie James, lost trace of the rope and walked astray in a foggy weather. Climbing Low's Peak is easy. Yes, you will use hands and legs to climb. But it is easy as like you walk a few steps and climb on a table, and walk two steps, climb on another table, etc. I found these two very funny articles sharing their experience of climbing Mt Kinabalu from Teun and Derek. Teun is a Dutch. He did not make it to the summit. He has an interesting account on how he struggled the climb. While Derek is a Canadian. His writing is comprehensive and funny. Is climbing Mt Kinabalu easy (or difficult)? 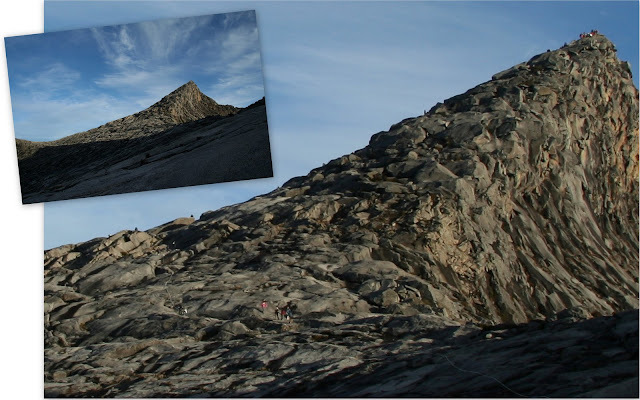 Terrain of Mt Kinabalu, Easy or Difficult? "Is climbing Mount Kinabalu easy? (or hard)", you ask. The truth is that you will get different answers from different people. Many say "YES" and equally many say "NO". Here is why. For it is technically easy. You don't need to have rock climbing experience. The entire journey to the summit is simply hiking upward. You walk! There is only a very short distance during the night climb to summit that you need to use your hands to pull a rope. Click here to see. Even if you are a working-9-to-5-exercise-lacking middle age city dweller like me, with some preparation, you can get up there easily. You have warm bed to sleep at night, sanitary journey like clean toilets (all the way up to approximately 7.0km Sayat Sayat check point right before summit), clean bathroom, hot water, dry towels, etc. and are reasonably well-fed with good food like buffet breakfast, buffet dinner, free flow of hot tea and coffee, even buffet supper at 2.30am right before your night climb to the summit. This is the only stretch of the entire trail that requires you to use your hand to pull a rope. It is not very steep. The trek itself is considered reasonably difficult, though most of the literature I have seen says “anyone of reasonable fitness can complete this hike”. Don’t be fooled, it is not easy, and some training beforehand would not go astray. If you think you can just walk up to Mt Kinabalu without proper preparation of fitness and equipments, you are heading for a hard time. It is still a 6km (probably 6-hour, some took longer) steep uphill walk to Laban Rata, and another 3km (longer than 3-hour) steeper night uphill walk up to a summit of 13,435 ft above sea level with only 62% of oxygen available at sea level. Easy or hard? It is the matter of subjective opinion. The weather can be a problem. Heavy rain makes you wet and uncomfortable and slows down your move. The temperature can go down to freezing level during your night climb. Without headlamp and battery you should kiss your summit attempt goodbye. Without a proper hiking shoes, like my friend who wore a pair of badminton shoes, you are bound to get yourselves hurt (He slipped and hurt his leg. He was not able to continue to summit but luckily was able to walk downhill). Without training, like the Malaysian's Deputy Minister of Youth and Sports, you are heading for injuries (He injured his ankle). You could subject to altitude sickness. Finally, with the exception of those ultra fit, your thigh muscles, legs, knees, ankles and or toes will go through a few days of pain after the heroic journey of climbing Mt Kinabalu. I like the comment of a blogger who climbed Mount Kinabalu. He said, "easy" is a matter of subjective opinion. But is it fun? Absolutely. Is it safe? If you prepare properly and are able to follow instructions, YES. Will I go again? Yes, I am planning for another climb through Mesilau Trail next year. Will I recommend anyone to go? This is a no-brainer, YES. Take a look at the terrain photograph of Timpohon Trail, km by km, from Kinabalu Park's Timpohon Gate to Laban Rata Resthouse. Click here for the KM by KM photograph. Take a look at the terrain photo of Summit Trail, km by km, from Laban Rata Resthouse to the summit. Click here to view the terrain photograph, KM by KM. How to increase your odds to reach the summit? 1. Fast pain relief ointments or creams like Yoko-yoko, Deep Heat, etc. You must read this advice from a doctor who blog about climbing Mt Kinabalu. Read another advice from this experienced hiker. others were eating bananas. She had a much easier climb than that of mine. Click on the photo to see the photo in full screen. It is spectacular. South Peak, 3,933 Meter, is the most famous landmark of Mt Kinabalu. I suspect it is due to its natural shape that it becomes famous. The most recognizable landmark of Mt Kinabalu, South Peak at the top of Mount Kinabalu. On my way up to Low's peak, I turned toward my back and took this photo. If you like this photo, you can download it as your wallpaper. If you like this wallpaper, click the buttons below and share this post in facebook, twitter, buzz, etc. As such, you are helping us too. Thank you. of Mt Kinabalu. Unforgettable climb of a life time. Spectacular view on the plateau. The highest point of South East Asia (geographical sense), Low's Peak at the top of Mount Kinabalu. I took this photo on the way up to the peak. Just click and download this image as wallpaper. 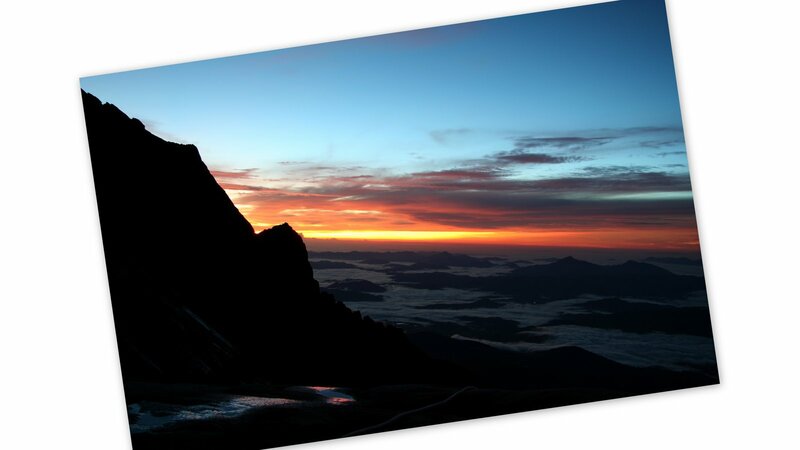 You can get more Mount Kinabalu Wallpaper here.